We are in the middle of a homelessness crisis. And despite ambitious efforts to end rough sleeping in the next 10 years, the numbers of those without homes continues to rise. In Oxford, over 100 households a month approach the City Council identifying as homeless and asking for help. In just five years rough sleeping in the city has increased by 175%. But beyond the hard-hitting statistics, why do people become homeless? Those familiar faces we see on our commute, what are their stories? And where are the thousands of homeless people who are aren’t living on the streets? It’s easy to think of the stereotypical image of a homeless person; curled up in a doorway, sleeping on cardboard boxes under layers of blankets. While this is sadly the situation for some homeless people, it isn’t reflective of homelessness as a whole. Homeless people live in our temporary accommodation, sometimes leading normal lives. Homeless people are surfing from sofa to sofa, still going to work. Homeless families are living out of emergency B&Bs, children still going to school. Homelessness exists beyond the streets. Approximately 200,000 people experience homelessness in England each year. Homelessness is triggered by many reasons out of people’s control. So it is important to remember that homeless people are no different from the rest of us. Any one of us could find ourselves homeless at any one point in our lifetimes. The leading cause of homelessness? The end of a private tenancy. Hundreds of families each week are made homeless through no-fault evictions. So while homelessness may have seemed a world away before rental prices sky-rocketed, today’s outlook is very different. Oxford is one of the most expensive places to live in England. The average house price of £491,000 is around 16 times higher than the average yearly household income of £29,400. Impossible house prices and a lack of social housing has led to a high demand for private rentals, giving landlords the power to charge extortionate rates. Imagine if your tenancy ended right now. You weren’t expecting it and you haven’t been given a reason why. You find a new flat but the landlord demands three months rent up front and a deposit of £1,000; you can’t afford it, what do you do? This is the reality for thousands of people right now. No-fault evictions may have overtaken as the biggest cause of homelessness, but it isn’t the sole reason. We can all agree that life doesn’t always go to plan. For some of us, life doesn’t start off well; we experience child abuse, lose a parent, become involved with the wrong crowds or grow up in care. For the rest of us, we have a good start to life but one day we lose our jobs, lose a loved one, escape an abusive relationship or become ill. And without strong support networks, chaos in our lives can quickly spiral out of control. No two people are the same, but there are common themes associated with homelessness; relationship breakdown, mental health, substance misuse, domestic abuse, care leavers and ex-offenders. Without a stable home, these themes escalate and often interlink, making an individual’s situation far more complex than just the need for a roof over their head. This is why quick-fix attitudes and solutions do not work, and is why our work is so vital. Tackling homelessness can feel overwhelming. It will take systemic change to shift the current landscape, but there are things you can do to make a huge difference. By supporting local frontline organisations, you can help people in your community to make real change happen in their lives. Each night Homeless Oxfordshire accommodates approximately 220 homeless people. 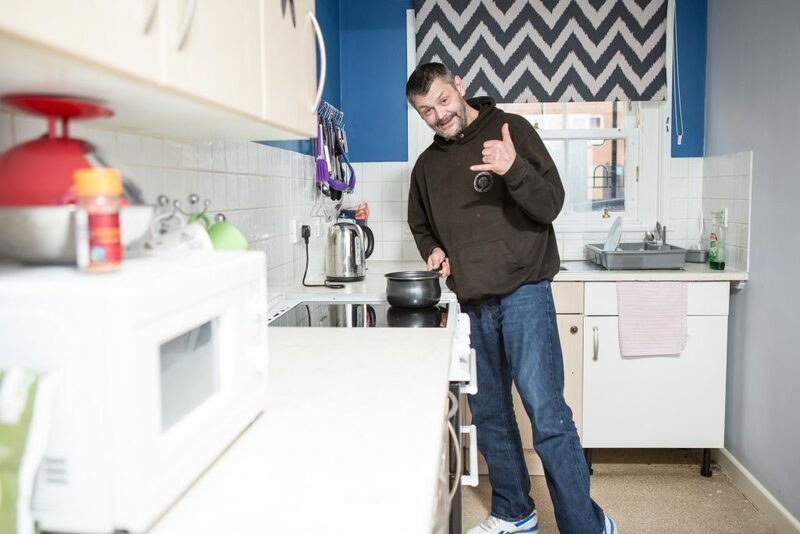 But beyond the bricks and mortar, we are one of only 7% of services in England providing emergency and second stage accommodation* as well as specialist services. “I lost my wife and twin boys – they died in a car crash in Swindon. I loved them so much. When you talk to people on the streets, they’ve always lost somebody or experienced abuse or something.” Andy, former client of Homeless Oxfordshire tells us. People like Andy are living a personal crisis every single day. They need support to overcome the traumas and troubles in their lives that have led to their homelessness. We provide this support. Our purpose is to get people out of homelessness for good. We know each journey is different but we’re here, every step of the way, to help people change their lives. Donating just £5 a month could support someone out of homelessness for good. Be part of the solution to the homelessness crisis, and someone’s personal crisis. Second stage accommodation includes specialist housing schemes and hostels that provide low, medium and high level support. Homeless Oxfordshire provides 24-hour high level support for multiple complex needs such as substance addiction, mental health problems and criminal-offending.